13. Esophagus. 14. Stomach. 15. 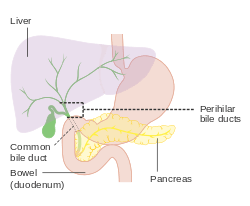 Pancreas: 16: Accessory pancreatic duct, 17: Pancreatic duct. 21–22: Right and left kidneys (silhouette). The anterior border of the liver is lifted upwards (brown arrow). Gallbladder with Longitudinal section, pancreas and duodenum with frontal one. Intrahepatic ducts and stomach in transparency. The biliary tract is the common anatomical term for the path by which bile is secreted by the liver then transported to the first part of the small intestine, also known as the duodenum. A structure common to most members of the mammal family, it is often referred to as a tree because it begins with many small branches which end in the common bile duct, sometimes referred to as the trunk of the biliary tree. The duct, the branches of the hepatic artery, and the portal vein form the central axis of the portal triad. Bile flows in the direction opposite to that of the blood present in the other two channels. 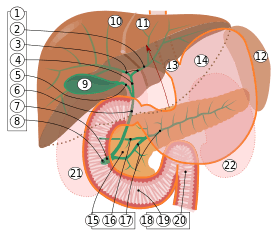 The system is usually referred to as the biliary tract or system, and can include the use of the term hepatobiliary when used to refer just to the liver and bile ducts.The name biliary tract is used to refer to all of the ducts, structures and organs involved in the production, storage and secretion of bile.